Internecine politics, clan rivalries, and werewolf-posturing serve as the backdrop for World Fantasy Award winner Martin Millar's novel Lonely Werewolf Girl, a story about anxiety and the slow agony of making friends. 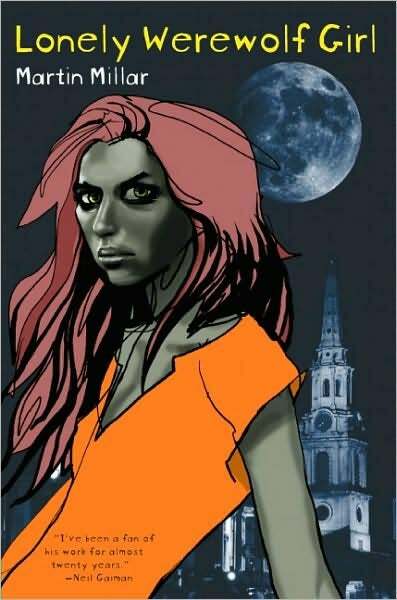 Lonely Werewolf Girl is the story of Kalix MacRInnalch, a laudanum-addicted, socially-anxious, anorexic, bipolar werewolf who, in a fit of rage, grievously injured her father, and was cast out from the family's estates in the Scottish Highlands. She has made her way to London, living as a street urchin and surviving only by virtue of her supernatural nature. Werewolf politics, however, have made her important to the family once again, and she becomes the object of the attention of her two ruthless brothers, in addition to a wide variety of werewolf hunters and, by her own good luck, a pair of improbably kind university students. There's a blurb on my copy of the book, in which Neil Gaiman says of Martin Millar, "[Millar] writes like Kurt Vonnegut, if Vonnegut had been born fifty years later and hung out with the wrong sorts of people." This is true, if a little misleading; Miller is not primarily a social satirist, and you won't really find the vicious indictments or scathing cultural commentary that you'd expect from a modern-day Vonnegut. Millar does, however, have a spare, direct, almost simplistic writing style, that is sometimes deployed to better or worse effect. There seems to be only two sorts of voices in which the major characters speak - these being "regular" and "absurdly flowery" - which, in a book where new and unfamiliar names are introduced every four or five pages, can make things a little difficult to sort out. The names themselves, though, are fantastic- "Kalix MacRinnalch," with all its gurgling glottals, is the ideal name for a Scottish werewolf. You can't say it without sounding like you're growling at someone. The style also makes deadpan humor sing; the elemental fire-queen Malveria's preoccupation with shoes and fashion, which might be a little dull in other hands, is made bearable by the dry, matter-of-fact treatment of the subject. The book is a little slow-going at first. It's quite a while before the plot begins to manifest itself in a way that's easy to care about. The early chapters seem to rest entirely on the reader's sympathy for Kalix's disordered mental state, and the curious juxtaposition of werewolf-enchantresses and haute-couture fashion houses. Whether or not the werewolves select a new thane is not of especially interest to either Kalix or her sister, and consequently of little interest to the audience. The book is, in fact, thick with things that are important to some characters, but are of no especial interest to the audience; Malveria is obsessed with fashion, for instance, but her clothes or shoes are rarely described in any great detail, leaving the impression that Millar is interested in a character who is interested in fashion, but not especially interested in fashion itself. This isn't necessarily a flaw; some people don't like to read about shoes, and there's nothing wrong with that. It does tend to make the narrative textureless, though, leaving the reader very little material with which to envision it. The story does build momentum though and-perhaps ironically considering how much time is devoted to: werewolves killing each other, werewolf hunters killing werewolves, werewolves killing werewolf hunters, political maneuvering among werewolves, and political maneuvering among fashion houses-the most compelling parts of the narrative actually come from punk-rock werewolves Beauty and Delicious MacRinnalch getting their act together, and anxiety-prone, bipolar Kalix starting to develop some healthy relationships. The plot still ends seeming a little scattered, with some mysteries never fully resolved (or even addressed; one wonders, for instance, just how many people in London need to die gruesome, horrible deaths before a state of emergency is declared-presumably some number more than twenty), but the emotional core is quite satisfactory. There is, in fact, something quite refreshing about the fact that the heart of the book is really about Kalix finding friends and finding something to do, rather than some world-ending werewolf apocalypse. The climactic battle after Beauty and Delicious' first gig is really ancillary to the overall advancement of the story. The armies of murderous werewolves and magic Mesopotamian death-knives are really just a kind of fantasy window-dressing on what is a story that is, ultimately, about the slow and uncertain process of coping with mental illness. Kalix's anxiety is treated-if not in a realistic way (I don't really have the background to speak to that)-in a frank, and sensible-seeming way. Ultimately, Lonely Werewolf Girl is a fun, sad, bittersweet book, and if the bloody werewolf battles leave you a little cold, it's because they aren't really that important, anyway. Lonely Werewolf Girl is available from Soft Skull Press.